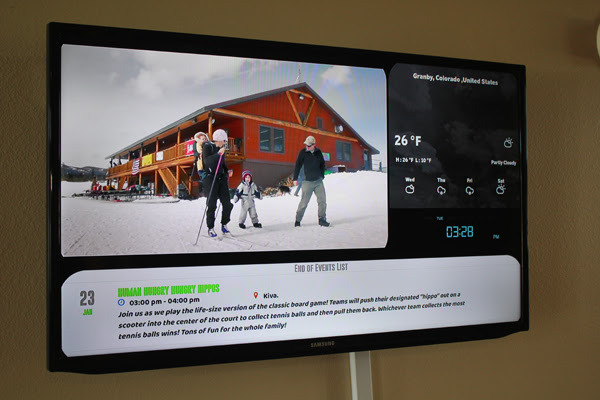 The YMCA of the Rockies, a non-profit network of conference centers serving more than 300,000 visitors annually, selected Mvix to power their digital signage network spanning two campuses. The solution was to implement a network of digital signage displays powered by the Mvix platform. Every building at the conference centers has a networked screen that displays information about available programs and activities, branded YouTube videos, slideshows of previous retreats and other supplemental information such as weather, time and emergency messaging. All displays are remotely controlled by the program directors. "Communicating with our visitors across many spaces can be difficult," said Mary Ann Degginger, the program director at Snow Mountain Ranch. "The Mvix signage solution has solved this problem and given us everything we’ve wanted from it very easily. It's been great for managing our branding in the centers." The digital signs can also be utilized in emergency events. Forest fires are not uncommon in neighboring Rocky Mountain National Park, and in the past, it had been difficult to communicate with guests on property. The Mvix solution allows the staff to easily notify guests in case of danger. "It's a privilege to know our solutions are serving a globally renowned philanthropy such as the YMCA," said Manu Saini, senior solutions consultant at Mvix. "We're excited to help the YMCA of the Rockies bridge the gap between their conference centers and build memorable brand experiences with their guests."